We listen to another episode of our documentary series about the Vietnam War, Shared Weight. 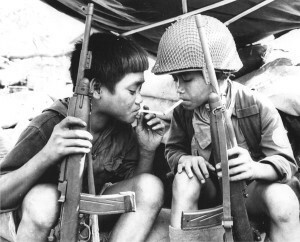 We hear Artists Born of War, where artists and writers from all sides of the Vietnam War reveal how that conflict influenced – and maybe even birthed – their work. Featured authors include: Tim O’Brien (The Things They Carried); Bao Ninh (The Sorrow of War); and Wayne Karlin (Wandering Souls: Journeys with the Dead and the Living in Viet Nam).